1NT: Forcing In standard bidding, a 1NT response to a 1♥ or 1♠ opening is nonforcing, showing a limited hand, meaning it has less than invitational strength. Many pairs, however (especially those who play the popular system called Two-over-One Game Force), deﬁne their 1NT response as forcing for one round, hence the name “1NT forcing.” Opener must bid again, even if it means bidding a three-card suit at the two level, to allow responder an opportunity to ﬁnish describing her hand. ♠A 9 5 4 3 ♥ 7 4 3 ♦ A Q 7 ♣K 6. After opening 1♠ (the opponents are silent), responder bids 1NT (forcing). If a convenient rebid is available, opener would choose it. Here, however, she rebids 2♦. Since the 1NT response is frequently played as denying game-forcing values (note that there are many ways to play this, however), responder can now make a non-forcing correction to her suit, such as 2♥ or 3♣, with the appropriate hand. Alternatively, responder may pass (with a diamond ﬁt) or take a preference to 2♠, which typically shows a doubleton. There are other possibilities as well, but this outlines the general structure. Semi-forcing Other pairs, even Two-over-One fans, allow opener to pass 1NT with a balanced minimum, such as the example hand above. 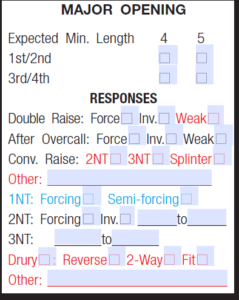 This approach is referred to as “1NT semi-forcing.” If you play 1NT Forcing or Semi-forcing, check the appropriate box. ANNOUNCEMENT: If you play either of these methods, you must Announce “forcing” or “semi-forcing” when your partner responds 1NT to your major-suit opening. BLUE items on the convention card require an Announcement. Note that you should discuss with your partner whether these treatments are in effect after interference or by a passed hand. 2NT: Forcing If you play that a 2NT response to 1♥ or 1♠ shows a balanced hand with game-forcing strength, check the box. Invitational If a 2NT response to a oneof-a-major opening shows a balanced invitational hand, check the box and indicate the high-card point range (11 to 12 is usual) for this bid. Neither of these treatments is Alertable. 3NT If you play that a 3NT response to 1♥ or 1♠ shows a balanced hand with a deﬁ ned point range, check the box and write the point range in the blanks provided. East may show a poor opening hand by rebidding his major (2♥). 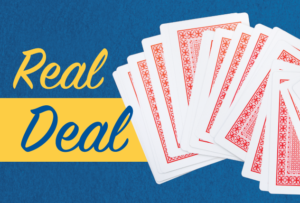 With full values, East could instead bid 2♦ to show a full opener. Since the meanings of these responses are the opposite of Drury, this treatment is called “reverse Drury.” Experienced players usually prefer the reverse variation. 2-Way As a further reﬁ nement to the Drury idea, some pairs allow responder to differentiate between three- and four-card support. The 2♣ response shows three-card support for opener’s major, while 2♦ shows four. Since the 2♦ response is needed for the four-card raise, this method requires that the partnership play reverse Drury. 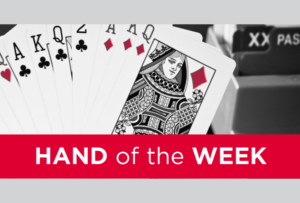 (1) have an invitational hand with three-card spade support. 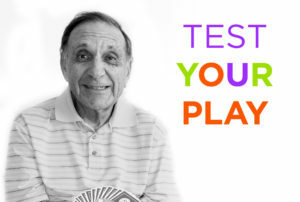 (1) I have an invitational hand with four-card spade support. Fit If your version of Drury guarantees a ﬁt (at least three cards) for opener’s major, check the box. Some players employ a variation which does not promise a ﬁt. The pairs would leave this box blank. ALERT Note that all of these Drury variations are in RED, requiring you to Alert when your partnership employs these methods. Other Other specialized agreements to a one-of-a-major opening may be listed here. These treatments require an Alert.